COLOGNE, Germany, July 4, 2018	(Newswire.com) - 4Stop (“FourStop GmbH”) announces that it has completed the second phase of their product enhancement which encompasses an optimal user experience redesign of their platform’s customer queue and customer in-depth profile interfaces, while expanding the monitoring, reporting and analytic features available. Within this phase two release, 4Stop continues its expansion of their all-in-one global KYC, compliance and anti-fraud solution to further support the ever-changing online eco-system. Now, through this product enhancement, businesses can drive efficiency within their onboarding process by quickly reviewing risk within customer registrations and effortlessly manage associated KYC verifications performed, all while ensuring a secure and frictionless onboarding experience for their customers. 4Stop's newly developed customer queue provides granular data from customers' first engagement touchpoint for businesses to view and analyze their failure rates, high-alert registrations and overall onboarding output. The customer registration queue provides detailed verification processing performance to further expand monitoring capabilities; easily view total customers to the newly registered customers, detailed KYC data source specific verification performance with comprehensive risk results data analysis and applicable rules activated specifically for onboarding customers. Risk managers can view data at a globally centralized view-of-risk or filtered by a specific merchant, sub-merchant or country. Within seconds, they are able to understand their risk exposure, view problematic registrations and rectify them, followed by easily adjusting rule configurations to support. Additionally, phase two incorporated a user experience redesign of the platform's customer profile data output reports and interfaces. The redesign ensured that all data from customer overall risk score, profile score, account details, electronic and document verifications, transaction history, fraud and risk patterns, associations and much more were carefully articulated within the profile report screen and functionality in a manner to support the best user experience. Through this redesign, 4Stop confidently streamlines risk managers' performance efficiency for them to not only have everything they require when reviewing a customer account but the ability to access and review all data required as quickly and easily as possible. By implementing this enhanced customer queue and in-depth easy-to-understand customer profile interfaces, businesses can exponentially manage their exposure to risk from the first interaction with their customers, resulting in an increase in their engaged verified customers and their overall lifetime value. Paired with 4Stop's on-going KYC with real-time cascading verification logic and advanced anti-fraud technology, businesses can dramatically reduce fraud and chargebacks and accelerate positive business performance. Through the company’s founders and collective experience within the risk management industry, they are deeply focused at maximizing their technology developments to service the online eco-system in an all-in-one, world-class KYC, compliance and anti-fraud solution designed for 2020 and beyond. Upcoming product technology enhancements will include enhancing their current platform and technology functionality with optimal user experience design; further technology developments in data analytic reporting output and monitoring capabilities; behaviour and machine learning; advanced account associations; and an expansion of their KYC data source hub. “Everyone at 4Stop is greatly passionate about building and providing the absolute best-in-class solution for businesses to effortlessly manage their KYC, compliance and anti-fraud requirements from a single integration. Through this passion, we are continually evolving our product to improve our technology offering and engaging experience for our clients. 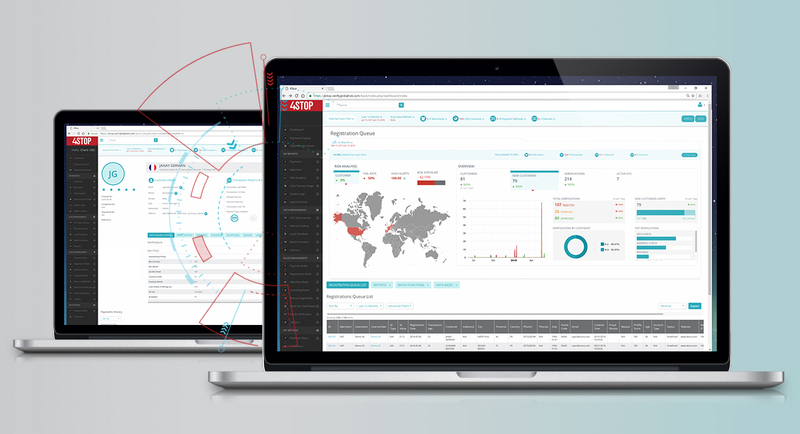 We are greatly excited to launch these initial enhancement releases and for our future developments, as we believe they will revolutionalise how businesses manage their online risk,” states Ingo Ernst, CEO 4Stop. For more information, please visit 4Stop at www.4stop.com. 4Stop are specialists in KYC, compliance and anti-fraud, who have built an all-in-one, best-in-class solution to bring confidence in customer authentication and verification, along with future-proof compliance for businesses across the globe.